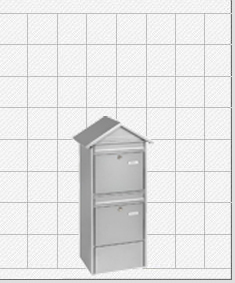 Extra large capacity post box made from galvanized steel with a silver paint finish. 2 x Front loading A4 letter slots with protective flaps. Can be used as two mail boxes stacked or via the removal of an internal shelf can be used as one very large capacity post box. Easy removal of contents via 2 x large drop down doors including door stops. Each door includes a Perspex name plate window. Constructed from galvanized steel to European Standard EN 13724. Can be used with or without roof. Suitable for floor fixing (fixing screws included).